101 Dalmatians has charmed audiences for generations with its irresistible tailwagging stars, memorable story and wonderful blend of humour and adventure. 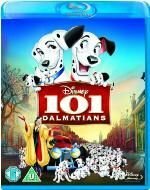 Cruella De Vil, Disneys most outrageous villain, sets the fur-raising adventure in motion when she dognaps all of the Dalmatian puppies in London including 15 from Pongo and Perditas family. Through the power of the Twilight Bark, Pongo leads a heroic cast of animal characters on a dramatic quest to rescue them all in a story the whole family will enjoy again and again.